I recently read the book of 1st John 2: 15 & 16, and it projected my thoughts into the practicality of reality with this question: which is easier; loving God or the world? Whom do you love ? Do you really love God or you're just a lover of this world. I can assume what the prevailing answer will generally be but you see, the sages say that actions speak louder than voice. What's even in this world that keeps our minds wavering in exciting emotions that aid spiritual demotion to the point that Jesus knocks at our hearts, the door to His house, yet we keep Him locked out thinking all still rocks within only to blame things on bad luck if Satan knocks us out. The lust of the eyes in action grasping information in dimensions to aid the lust of the flesh at divers sections formed into a locking intersection of great fortification through the interjection of pride. Tensions of emotional detention, distractions from stolen attention, deviation in confusion to yield to temptation; that wrong decision tweaking the direction of our vision from the destination of our mission. You see, that's when GRACE comes in; you cannot take God's love out of the equation 'cos that´s the equating mark that keeps and strikes the balance; sometimes we think we're strong enough until proven wrong by our strength since man's strength doesn't last long; so if we hit the wall and fall, GRACE helps us stand tall again to justify God's call. You need to understand that our separation from the pollution and corruption of this world is a function of our connection to the divine author of creation. There's something about the worship of our sonship to the Lordship of the author of all relationships which launches us beyond the courtship of partnership to the level of friendship.
'' now that's the point; the sweet fellowship of friendship in discipleship. Oh yeah, Discipleship! 'Coz disciples, that's what we are; disciples in a race according to Heb 12: 1; which reminds me of the secret sins and weights that beset, but here comes the phrase, 'It doesn't really matter.' Like seriously, just like Martha thought that the extra matters that Mary discussed at the feet of the master didn't matter ? Martha didn't know that what she thought not to matter actually had enough weight to make her occupy space in the divine schemes of things that matter in the place of base of the ancient of days. I´m talking about having ones name framed on the walls of heaven's hall of fame. One was termed prodigal, his brother wasn't. I'm talking about two brothers in question with a questioned fellowship relationship; one due to arrogance while the other due to ignorance; it's all the same as giving Satan the chance to steal the fragrance of our dance to make us dance in a trance of shame. You need to understand that God's interested but not delighted in the righteous that falls and remains fallen. He's delighted in those that rise again to the place of sweet fellowship because grace has been infused and diffused into the atmosphere. Oh yeah, some reject and refuse it but some others only accept it to abuse it. Grace is not to be misused as an excuse to stay out of fellowship under the covering umbrella of righteousness but to be used to stay in constant fellowship; unmerited fellowship; sweet fellowship of the Holy Spirit unto holiness. Titus 2:11 reminds me of this grace, God's Riches At Christ's expense, verse 12 makes me understand that it's also a way God Reminds All Concerning Eternity. 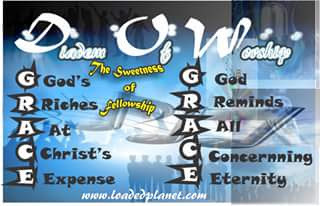 The sweet fellowship of the Holy Spirit rest and abide with us for ever more. Amen.